That's not the game score of competing forces, it's the relative ages of an old church and their new young leader. This afternoon, at a Meet and Greet service, Pastor Eldern Morrison was welcomed by the New Haven Community. 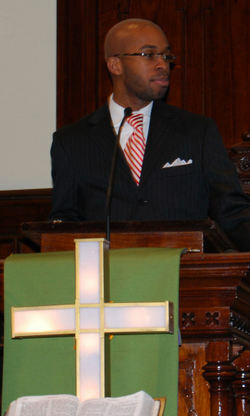 He is Varick Memorial AME's 42nd pastor in it's 190 year history. This 27 year old has captured the hearts and restored the vision of "New Haven's oldest and most historic Black church." Pastor Morrison is already loved and has been warmly embraced by the congregation. He's a a dynamic preacher and a visionary with great plans in his heart and mind. As he slipped it into high gear for the climax of his remarks, Pastor Morrison conceded that other candidates for the position may have had more experience and seemingly more to offer, but that he was, in the similitude of King David, fully "available" to God for the work at hand! You had to be there to understand why people were on their feet at this point cheering for both God and the young preacher from South Carolina. It was obvious that in the city of New Haven, at a church called Varick AME Zion, that there was man sent from God whose name is Eldern. Clearly, he is called here to pastor. Please keep Pastor Morrison and the Varick congregation in your prayers. Welcome, brother! May the honeymoon last forever....and whether it does or doesn't....we're here for you!